Did you know learning to sleep is a developmental process? It is a good idea for daycare teachers to ask parents or guardians what their child’s sleep routine is at home. Daycare teachers may then adapt several children’s home practices to their classroom to help children sleep better at daycare. Teachers in daycare settings should stay consistent with children’s napping routines to promote the optimal developmental sleep process for each child in daycare. 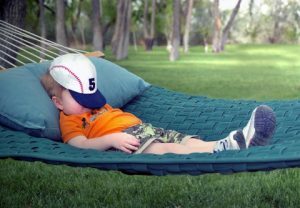 Children fall asleep much better in daycare if they are already well rested. Children in daycare may not nap well if they are stressed or not feeling well. Children do feel stress just as adults do and stress definitely affects children’s sleep in a daycare setting. Teachers in daycare should keep a close watch on low energy and a lack of socializing with children who are usually social and active. This is a strong indicator that children may not sleep well at nap time in a daycare setting. Learning to sleep is a developmental process and daycare teachers can help children with this very important process. Teachers in daycare have an obligation to provide a safe and comfortable sleep environment for children in their care.